Soil-transmitted helminth (STH) infections are a prevalent problem in sub-Saharan Africa. Helminths, parasitic intestinal worms, pass their eggs in the feces of infected individuals. When infected individuals defecate outside, or their feces is used as fertilizer, soil can become contaminated and create new avenues for the worms to infect humans, wildlife, and domestic animals. 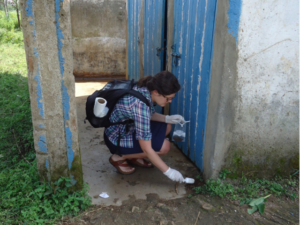 Some scientists suspect that improved sanitation efforts near houses could reduce STH infections. A team of researchers, including CEID member Lauren Steinbaum, conducted a study to test this hypothesis. The study observed a control group (n=1919) which had limited sanitation efforts and two other groups that received a sanitation intervention. One of the experimental groups (n=892) had plastic slabs installed over latrines and were given child feces management tools. The second experimental group, the water treatment, sanitation, and hygiene (WSH) group (n=912) received the same sanitation upgrades as the first experimental group, as well as materials to improve drinking water, and soap for handwashing. 2107 soil samples were collected over 29 months to study the prevalence of STH eggs across all groups. Their results showed a similar presence of STH eggs in soil across all groups. However, they did identify factors that may affect the amount of STH eggs in soil. Shared latrines, latrines fully covered by a roof, latrines in households and communities with dogs, and sample sites with increased soil moisture were all associated with a higher prevalence of STH eggs in soil. Conversely, latrines with a covered drop hole, and latrines that are 2+ years old were associated with a lower prevalence of STH eggs in soil. While their findings did not show decreased STH eggs in the soil of the groups that received the interventions, Kenya has the possibility to eradicate STH infections due to their current financial and political situation. There are already efforts in place to decrease helminth infections, such as the national school deworming program. However, more research is needed on soil contamination and transmission in order to better understand and eliminate STH infections.